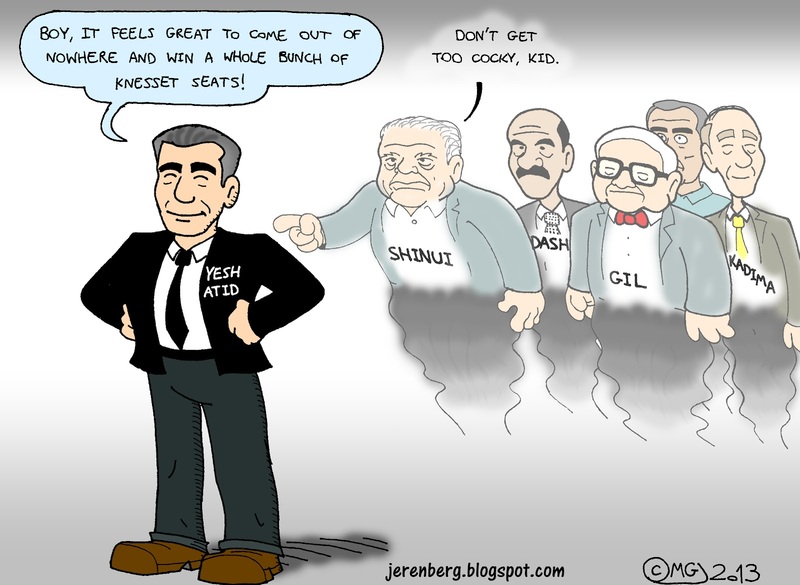 Well, the results are in, and Yair Lapid's brand spanking new Yesh Atid party has clocked in at 19 mandates. History indicates that he should enjoy his popularity while it lasts: Israeli "fad" parties tend to have a brief shelf life. (Shinui went from 6 to 15 to 0; Gil, the Pensioners' Party, went from 0 to 7 and back to 0; the Democratic Movement for Change, or Dash, one-upped them by going from 0 to 15 and back to 0, lasting than three years; Tzomet went from 2 to 8 to 3 to 0; and Kadima was born in sin with 17, was officially elected to 29, then went from 28 to its current 2.) Coincidentally, Shinui was led by Yosef "Tommy" Lapid--Yair's father. Foreshadowing? Time will tell. UPDATE: Ho hum, another LBd'O reposting. I'm blasé (French for "blazzy").